Pacific Fog is world famous. In fact, it is the probably the only thing that late risers see in Coastal California. The magnanimous Redwood Trees California owe their existence to this famous Pacific Fog. According to Scientific American, the Redwoods with their baseball mitts like leaves capture the fog that rolls in. This ensures that Redwoods live longer and it is not surprising that they are some of the tallest and oldest trees of the world. Scientific American also states that the fog covers the leaves of the Redwoods and prevents evaporation. Not just that, some of the fog also enters the stomata, or tiny pores on the leaves and is drawn down through the branches to the roots. Isn’t that Amazing?? And we always thought plants take water from roots. Redwood Trees are the first one discovered to move water in both directions. Here is the full scientific American Article. This photograph was taken at of course, mid-day as we driving south towards Los Angeles from San Francisco, California. 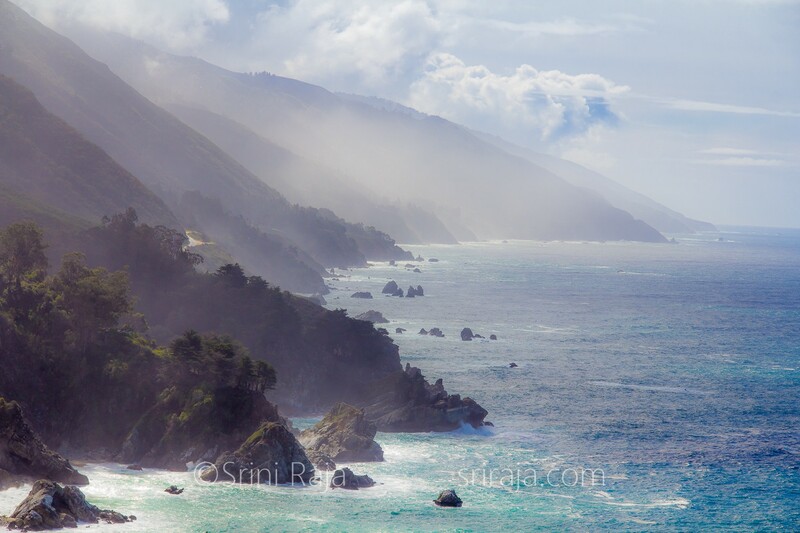 After finishing up my morning photographs, I was driving to McWay Falls and saw this beautiful view from the Car’s wind shield. I had attempted to take a similar photograph almost a decade ago and was not happy with the result. I had analyzed my previous attempt and realized the mistakes I had done while capturing that photograph. That preparation helped me capture the mood of the fog and lights much better this time. I have an advice for many tourist folks visiting the Big Sur. Don’t get thrown off by the fog. The fog adds magic to the landscape, so sit there for sometime and you will see some amazing stuff. To receive discount on my upcoming book.